Sylvia Vetta pictured with her latest book which she will be promoting at Antiques on High in Oxford. 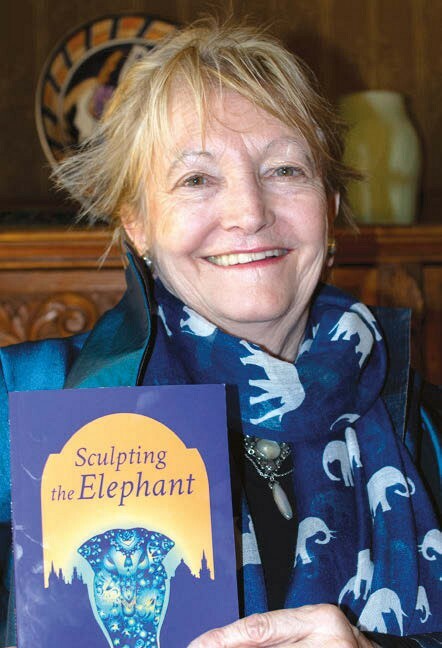 Sculpting the Elephant is a love story with an antiques theme, set in Oxford and India, and the antiques centre’s window will include Asian antiques, Art Deco and Oxford-related pieces which are central to Vetta’s book. With ATG, Vetta launched the campaign for an antiques road sign logo in 1999, was chair during 1997-2001 of the now defunct TVADA (Thames Valley Antiques Dealers Association) and one of the directors of Oxford’s first antiques centre, the Jam Factory, which thrived in the 1980s. Related promotional events at Antiques on High will include a display of archive material including a nostalgic look around Oxford’s art and antiques scene. Antiques on High’s complement of dealers has now grown to 44, while its sister centre in Sidmouth, Devon, which opened in December 2018 now has 28 including a nautical specialist. The centres’ owner Vincent Page continues to look at other locations for a third Antiques on High.